For the past twelve years, father and son Gary and Justin Van Riper have been creating The Adirondack Kids series to families, schools and libraries throughout New York state and right around the world. 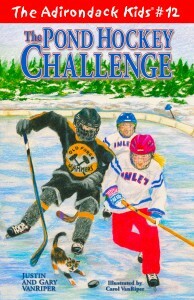 2012 sees the release of their latest book: The Adirondack Kids: The Pond Hockey Challenge. Focusing on the adventures of three friends, Justin, Jackie and Nick, this brand new adventure, winter has arrived and beloved characters, Justin Robert and Nick Barnes are on school break and discover their best friend, Jackie Salsberry, has committed them to a pond hockey game against an experienced team from the community next door. It's the Inlet Snowcats verses the Old Forge Hammers. The Adirondack Kids books explore historic and familiar places around the Adirondack Park. Over 100,000 copies of the Adirondack Kids books have now been sold. And they keep getting better. Long time readers of the series will note that this is The Adirondack Kids first wintertime adventure. Be sure to visit adirondackkids.com for more information. Labels: The Adriondack Kids, The Pond Hockey Challenge.